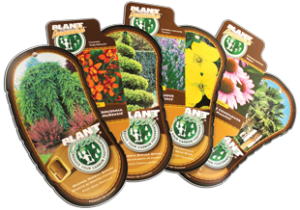 To assist our customers with providing helpful plant information to consumers, Inline has introduced the Planet Green and Planet Perennials brands. The message behind these branded tags is to stress to consumers the enormous role that plants play in ensuring we pass on a clean and sustainable environment to our children. The eye catching design, vivid pictures and growing tips on the reverse side also help entice the consumer to purchase the plants. Our planet’s fragile ecosystem is being damaged daily by CO2, which is created by many daily routine activities that we as humans perform. All plants play an important role in our environment and carry a unique ability to absorb the harmful CO2 through a process called photosynthesis. This process creates the fuel (carbohydrates and sugar) which naturally feed the plants. Humans benefit from this process by receiving the clean oxygen we breathe everyday. Plants also play a critical part in cooling the air around us, filtering the air we breathe and stabilizing the landscapes around us by absorbing and diverting excess rain runoff. Next time you plant a tree or shrub, remember you are helping to reduce your Carbon Footprint.